Regardless of your political background or persuasion, no one can take a look at the vintage film of former Senator Ted Kennedy early in his life giving a moving eulogy for his older brother, Robert F. Kennedy at St. Patrick's Cathedral in New York in June, 1968 and not be moved by his words and affections for his slain brother. 'My brother need not be idealized, or enlarged in death beyond what he was in life; to be remembered simply as a good and decent man, who saw wrong and tried to right it, saw suffering and tried to heal it, saw war and tried to stop it'. The text and the transcript of the speech can be found here. Try to read through it if you can because it really is one of the great speeches in American history. It also contains some golden nuggets for all of us to consider as we await the outcome of this momentous election on Tuesday, November 6 for President of the United States of America. 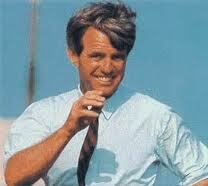 In the eulogy, Senator Ted Kennedy refers to a speech Robert Kennedy (RFK) gave in South Africa two years earlier in 1966. The words of that speech (truncated below) resonate as soundly today as they did back then. 'There is discrimination in this world and slavery and slaughter and starvation. Governments repress their people; millions are trapped in poverty while the nation grows rich and wealth is lavished on armaments everywhere. These are differing evils, but they are the common works of man. They reflect the imperfection of human justice, the inadequacy of human compassion, our lack of sensibility towards the suffering of our fellows. But we can perhaps remember -- even if only for a time -- that those who live with us are our brothers; that they share with us the same short moment of life; that they seek -- as we do -- nothing but the chance to live out their lives in purpose and happiness, winning what satisfaction and fulfillment they can. Some believe there is nothing one man or one woman can do against the enormous array of the world's ills. Yet many of the world's great movements, of thought and action, have flowed from the work of a single man. A young monk began the Protestant reformation; a young general extended an empire from Macedonia to the borders of the earth; a young woman reclaimed the territory of France; and it was a young Italian explorer who discovered the New World, and the 32 year-old Thomas Jefferson who [pro]claimed that "all men are created equal." Keep those in mind from here on out. Those are the essential ingredients to the leadership stew we need to get this country back on track. Why are the words in this speech so timeless and still pertinent in America today after these intervening 44 years since RFK was senselessly assassinated in the basement of the Ambassador Hotel in Los Angeles in 1968 by Sirhan B. Sirhan (who is still alive in prison by the way)? Because they inspire us all to do more to help make this nation, and world, a better place to live. Despite the rhetoric of this presidential campaign that has lasted longer than any campaign should, and the truly horrendous, insulting and somewhat insane words by many on both ends of the political spectrum, we still think America is a pretty darn good place to live, work and worship in freedom and relative 'luxury' when compared to the rest of the world. We think Mitt Romney is a 'good and decent man'. We think President Obama 'saw wrong and tried to right it'. We think both of them 'see suffering and want to heal it'. No one wants war so why would anyone not want to 'stop it' when they see it happening? Each one has different ways to try to achieve these noble ends. President Obama believes strongly in the power of the federal government and the executive office of the President to get things done his way in much more of the classical Federalist concept of top-down governance (although the Federalists of those days would be truly shaken by the size and scope of the federal government in place today). Governor Romney believes in more executive and legislative power devolving back to the states and localities to let them solve problems closer to their source in more of a Jeffersonian-Madisonian view of the world. We just happen to agree far more with Mitt Romney's view of the role of government in the United States of America than we do President Obama's view. Anytime we see a concentration of power in the hands of a very few anywhere, to be honest about it, including Wall Street for example, the hair on the back of our necks stands straight up and alarm bells go off in our heads. 'Power corrupts and absolute power corrupts absolutely'. Plus, we absolutely hate and detest the grotesque waste of your hard-earned taxpayer dollars while we are, at the same time, borrowing money in the most profligate manner and running up exorbitant amounts of debt for our children and grandchildren to deal with. We had hoped that President Obama would show some sort of concern as perhaps the 'transformational President' that millions of his supporters in 2008 thought he was going to be....but over past 4 years, he did not. Sadly. For everyone concerned. We think we have shown that concern for fiscal discipline and budget creativity in spades in this blog over the years to your heart's content. We hope we have satisfied your curiosity as to whether we can reform federal spending and balance our budgets that way first before considering any more confiscation of your hard-earned tax dollars. Having such differences about public policy in a democratic republic doesn't make us 'bad people'. Having these differences and being able to talk about them in public and on the airwaves is one of the pure gifts given to us by the Founders of this nation and the Bill of Rights amendments to the US Constitution. We wouldn't be America without such a free-spirited discussion of the issues that concern us about self-governance. May it ever be so in the United States. Try to remember these inspirational words about Robert F. Kennedy regardless of who wins the White House, the Senate and the US Congress in any given election. We, the people of the United States of America, are what gives essence and credence to the American Dream and way of life, not any single or group of politicians at any given moment in time. But we do have to have good and decent elective leaders to help keep our way of life going. Choose wisely or run yourself. Those are the only two options we are ever going to have in America.